JPG is the world’s most popular digital image format and it is a lossy compression system, which basically means the bigger the compression of the file, the smaller the size, but the overall quality of the image will suffer. On the other hand, if a user chooses a smaller compression rate, the file will be much larger, and the quality will remain amazing. JPGs compression functions by exploiting the eye’s natural imbalance of differentiating the amount of light that an image has, and our perception of color differences. The eye can detect the subtle changes in lighting conditions far better than the changes in color (this is why we almost see completely black and white in poor light conditions). JPG focuses its compression on the color-part of data, and leaves the lighting part intact. PDF files can combine text, bitmaps and vector images whereas JPEG files are actual bitmap images. JPEG file doesn’t look good if you scale it to be bigger than its normal size. On the other hand, PDF files contain text that is scalable and it won’t be blocky when you scale it. If a PDF file contains vector images, you can scale it without any problems. PDF files can include embedded fonts, whereas JPEG files cannot. You can use different image compression programs to shrink the size of your image file. But if you are already learning how to convert PDF to JPEG, you can use the same PDF to JPG converter to reduce the file size of your JPEG. Start PDF Converter Elite and open a PDF. Click on the Edit menu and then the Resize Pages button. Change the size of your PDF and then convert it to JPEG. Below you can find more information on how to convert PDF to JPEG with PDF Converter Elite and how to resize pages. Why are PDFs converted to JPG? PDFs are mostly converted to JPG for extraction of images from PDF files that usually contain parts that are visual in nature (like pictures, images, graphs), and other textual parts. So if we want to isolate the pictures from the text, we’ll use PDF to JPG conversion. If we require to edit the image that’s inside of a PDF file in any way imaginable, we firstly have to convert the PDF to JPG. This is because the PDF has a read-only nature, which doesn’t allow any kind of editing prior to the conversion, which returns the file into a perfectly editable native state. PDF files are bigger than JPEG files in general. So, if you want to decrease the file size of your PDF document, use PDF to JPG converter. Your computer or usb will now have more space. How do you convert a PDF to JPG with PDF Converter Elite? How do you save separate images from PDF as a JPEG? How do you convert a PDF to JPG with Adobe Acrobat Pro 11? How do you save separate images from PDF as a JPEG with Adobe Acrobat 11? 1Download PDF Converter Elite here and run the program. 2Open the PDF file you wish to convert by clicking on the Open icon on the menu bar. 3Browse the PDF you wish to convert and click Open. 4Choose the Image icon on the Toolbar or from the Menu bar click on the Convert button and from the drop down menu choose PDF to Images conversion. 5A side bar will appear on the right where you should click on Select All Pages to convert a whole PDF. 6You can also change image options by changing the image format or image size as shown below. 7Once you are done click Convert. 1Open the PDF file in PDF Converter Elite in the same way as it is explained above. 2Click on the Image icon on the Toolbar or click on the Convert button from the Menu bar and from the drop down menu choose PDF to Images conversion. 3When a side bar appears on the right, choose the option Select Area instead of Select All Pages. 4Again, you can change image settings by altering the output type, adding gif animation speed etc. 5Once you are done just click Convert. 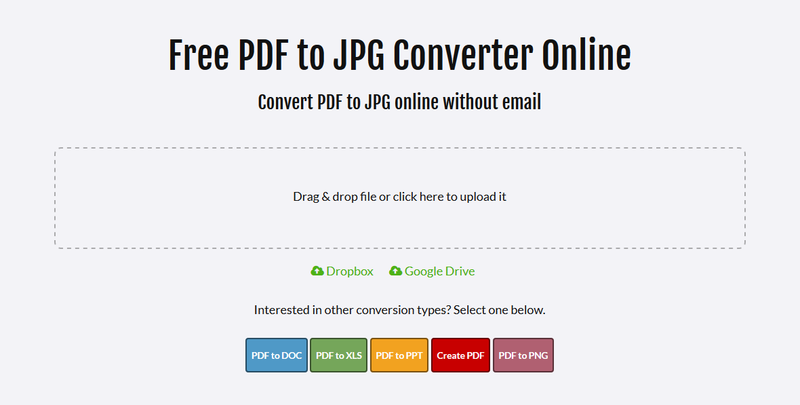 Use our brand new PDF to JPG converter online to save your PDF files as JPEG. Drag and drop file from your computer or upload it from the mobile device. You can also import PDF files from Google Drive or Dropbox. The converted file is ready for download in a few moments. No email is required, convert as many files as you like but not at the same time. If you want batch conversion from PDF to JPG, go to section about PDF Converter Elite. 1Open the PDF file you wish to convert. 2Choose Save As Other... > Image from the File menu. 3Choose either JPEG or JPEG2000 from the options available from the list. Choosing JPEG2000 will provide better quality image due to the compression it uses and its ability to display images at different resolutions. 4Use the Settings... option to adjust file before conversion. Here you can adjust your file settings, color manage your file, and conversion settings. Click on OK.
5Save your file. Once saved, your entire document will appear as an image file in you default image viewer. 1Select Document Processing from the View menu. 2The Tools Pane will open. From the list of options, select Export All Images. 3In the Export All Images As dialog, ensure that JPEG is your saved file type. Click on Settings... to bring up the dialogue of conversion settings. 4Adjust File Settings, Color Management, Conversion and Extraction settings. Click on OK.
5Click on Save in the original dialog to continue the process. Your images will be saved and numerically filed. Once saved, your images can be viewed as separate files.